The special connection between agriculture and tourism in Wales will be celebrated by Welsh Government at an event at the Royal Welsh Show today. The Tourism and Agriculture Working Together event at the Welsh Government Pavilion will be hosted by Minister for Culture, Tourism and Sport, Lord Elis-Thomas to acknowledge strong and enduring partnership between farming and tourism and to celebrate the role that farmers, food producers and land managers play in making Wales such a welcoming and top quality holiday and visitor destination. It’s a partnership which the Minister was clear would need to be maintained and strengthened if both industries were to remain prosperous. Speaking ahead of the event, Lord Elis-Thomas said, “Today’s event is an opportunity for me to first and foremost thank our farmers, food producers and land managers for their role in making Wales the destination it is, whilst hopefully opening a few doors to further future collaborations and opportunities. 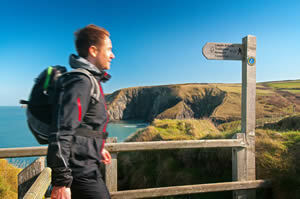 “Over 10 million people again chose to holiday in Wales last year – over three times the population of Wales. “Many come to Wales because of the famous ‘croeso’, which relies on a delicately balanced ecosystem. Individuals, communities and organisations working effectively together to keep our walkways accessible, our beaches clean and our water clear. Suppliers, producers and promoters recognising and championing the benefit of quality, local produce. From star gazing to zip lining, Welsh lamb to local beer and everything in between, it’s the quality of the experience that makes people continue to choose Wales in such large numbers, and the agricultural industry is right at the heart of that. “Whilst Brexit no doubt brings with it uncertainty, challenges and change, particularly within the agricultural sector in Wales, what’s beyond question is that the intrinsic link between agriculture and tourism must and will remain.